Our family loves Burger King. I especially love the fries. Burger King recently launched their new Burger King Crown Program. With the BK CROWNTM/MC Program, Burger King Corporation invites kids to tell BURGER KING® what matters to them most. BKC has established a fund to help support four different charities. Have It Your Way™ Foundation. By visiting BKCrown.com, kids learn how BKC’s charitable partners make a difference. Upon entering BK CROWNTM/MC Codes and clicking on their favorite cause, each kid’s vote helps BK® choose which charity to give back to. How would you like to win a $25.00 Burger King Crown Card to experience the Burger King Crown Program with your kids? 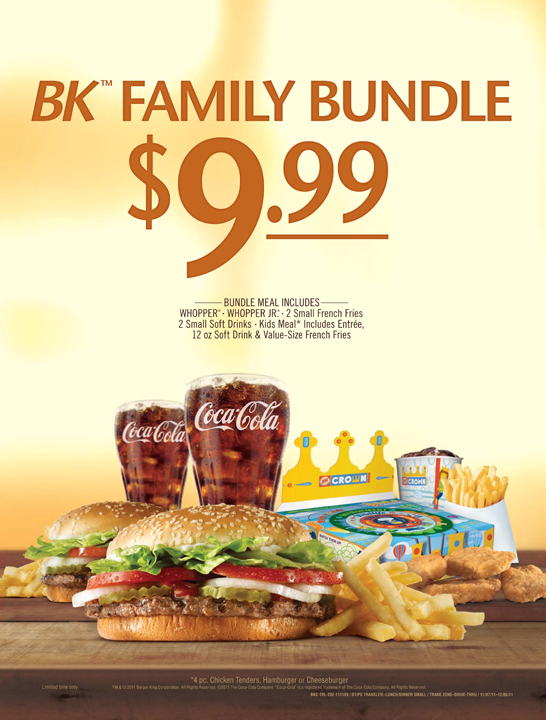 (1) $25 BURGER KING® Crown Card* to purchase a kids meal featuring the BK CROWNTM/MC Program. Winner will be chosen January 26, 2012 at 12:01 am. Open only to US residents and must be 18 or over. Click here for more information about the BURGER KING Crown Program. Follow Burger King on Twitter. “LIKE” Burger King on Facebook.